January 2014 Market Update: Looking at 2013 Year-In-Review. Hello and thanks for checking in with us regarding the state-of-affairs in the Big Bear real estate market. We diligently track and analyze Big Bear’s unique real estate market and our aim is to make this your one-stop-shop for all the latest Big Bear real estate information. Should the urge to buy or need to sell arise, we most certainly look forward, and are very able, to help you obtain a great result. 2013 was a solid year for the Big Bear real estate market. In the paragraphs to follow, I will update you on how the market fared with respect to price and number of sales, as well as cover some important market statistics that are worth keeping an eye on. The distribution of the overall increase in price for the different areas of Big Bear varied: Moonridge saw an amazing 22.4% increase, Sugarloaf increased 19.3%, Fox Farm was up 12.9%, Big Bear City up 9.9%, whereas Big Bear Lake proper was relatively flat. The total number of residential sales here in Big Bear increased 13.3%. Combined with the impressive 24.7% increase we saw in 2012 that brings the two-year total increase in residential sales here in Big Bear up an impressive 38%. It is interesting to note that most of the money is still changing hands in the market under $250,000, with over 90% of the market changing hands at under $500,000. 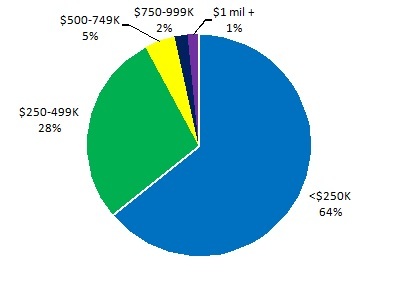 28% were between $250,000 and $500,000. The following chart illustrates the 2013 breakdown by price range as well as highlights which areas were most responsible for 2013’s 13.3% increase in the total number of residential sales. Overall in the Big Bear real estate market we are still experiencing a low inventory – we have just over 4 months of supply vs. the 6 months that dictates a ‘balanced’ market – and increasing demand. This climate bodes well for the potential of appreciation to continue in 2014. The wildcards for any real estate market this year, Big Bear included, are the economy overall and most importantly, interest rates. Rates, although they did increase a bit in 2013, are still holding at historically low levels, making 2014 still a great time to buy a great piece of real estate in here Big Bear. As always we look forward to hearing from you and, until next time, happy hunting. Posted in 2014 Posts on February 5, 2014 by Mike Sannes.